« Why Do Market Researchers Play the Lottery? Marketers tend to be obsessed with graphs. A challenge for many research projects is determining how to best distill statistics gathered from hundreds of respondents into a simple picture that makes a convincing point. A good graph balances a need for simplicity with an appreciation for the underlying complexity of the data. Recently, as part of a year-end series, the Washington Post has been unveiling its “Graphs of the Year.” The Post has been inviting its contributing “wonks” to choose one graph that best encapsulates 2013 for them. I found myself spending way too much time looking through them. Some of the graphs are truly outstanding summaries of a key issue – and their conclusions are striking. Others show the political biases of the wonks themselves, and show how data can indeed be manipulated to make a point. If I were to teach a class in market research, an entire lesson would be devoted to these graphs. I judge graphs by a simple criterion: If you were carrying a deck of graphs down the hallway and one fell onto the floor, would someone who picked it up be able to understand its main point, without any other context? We try our best to draw graphs that meet this threshold. In the end, the good graphs from the Post are those that spur thought and are ideologically independent. In particular, I like Bill Gates’ graph which shows the causes of death in the world as well as how each is increasing or decreasing. This isn’t a simple graph, but it clearly shows the progress the world is making and priorities for the future. Some graphs didn’t do it for me. Senator Wydens’ graph reminded me of a David Ogilvy quotation: “They use [research] as a drunkard uses a lamp post — for support, rather than for illumination.” Wyden’s graph came off as a platform to make a political point. It confused me and I didn’t see how the conclusions he suggests flow from the graph at all. Senator Patty Murray’s graph may very well make a valid point about what drives the federal deficit, but it shows a shocking example of correlation and causation not being the same thing. Just because two lines are displayed next to each other does not mean one leads to another, or in this case, does not mean they are not correlated. Her explanation of the graph is political and as far as I can tell the graph not only doesn’t illuminate her point. The graph doesn’t seem to make any point at all. Perhaps the most misleading graph comes from Peter Thiel. His graph indicates that as student loan debt has increased, the median income of households with a bachelor’s degree has declined. The problem? The two lines on the graph are on different scales! The median income line is shown per household. The student debt load line is across the entire population. They aren’t comparable. To make sense, the student debt load should instead be shown on a per household basis. College enrollments have increased steadily over the time frame of the graph, so of course debt load in total will be increasing. And, as a wider base of students pursue degrees, it would be expected that median income might be impacted downward. This is not to say that student debt is not an important issue – as it clearly is. But, this graph seems to take the focus off student debt and indicate that college education does not pay off. This graph shows the Presidential approval rating tracked since modern polling began. It begins with Harry Truman and on Gallup’s site it runs right up to Obama’s current numbers. I like it because it is a clear and consistent measure over a long period of time. To me, it is fascinating to look at with a mind towards what was going on historically as the polls were taken. It shows how memories can change as events move to the past. For instance, G.W. Bush’s approval rating was nearly the highest ever measured early in his Presidency (just after 9/11) and moved to one of the lowest ever measured by the time he left office. Clinton is the only President whose approval rating displays a positive trend throughout his term in office. Kennedy’s approval rating was moderate by historical standards near the end of his time in office. To me, it is fascinating to think of a historical event and then look at the chart to see what happened to approval ratings.Watergate preceded a large drop in Nixon’s ratings, and Ford’s pardon of Nixon did the same. Once WWII was over and the US became mired in Korea Truman’s popularity took a huge hit. 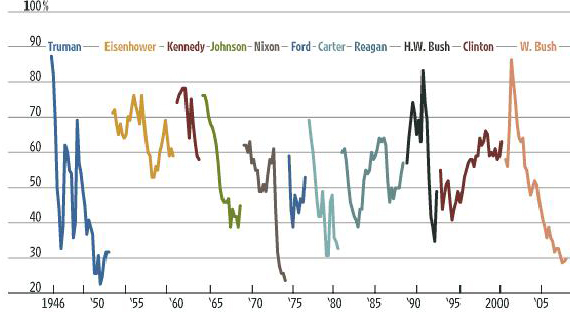 Eisenhower’s ratings were very stable compared to others. All Presidents start office with their approval ratings at their highest. It seems that the first day on the job is the best day. Which may be why the first 100 days is always considered key to any Presidential agenda. Although graphs may be best judged by their ability to convey one thought, I find that I can stare at this one for hours.